Our Navy Maxi Dress with Embroidered Tulle Skirt is so pretty! Perfect maxi dress in elegant Navy color with embroidered detailing and criss cross back. 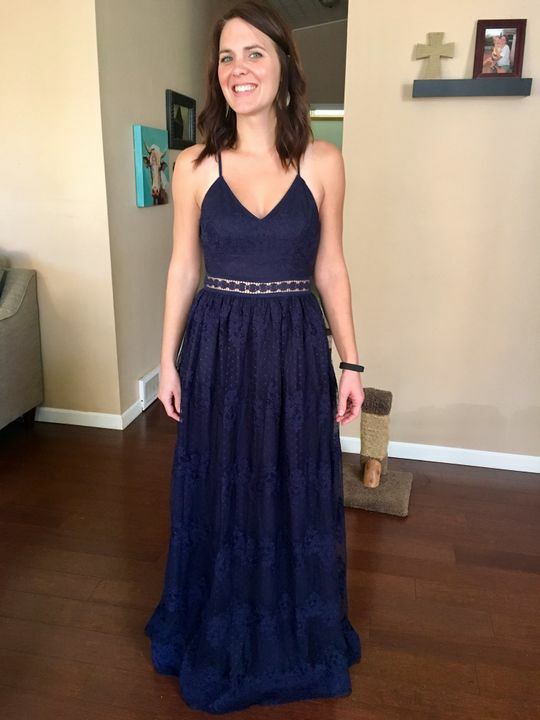 I was hesitant to order a dress without trying it on first, but I went ahead and got this navy dress and I love it! I am 5’5”, about 130 lbs, and I ordered a medium. It fits perfectly! I will have to get the length altered, but other than that, I’m so excited to wear it! I can’t ever say enough about this company.. REAL people answer the phone and answer all your questions. The clothes fit how they say they will, just follow the size of the model. Bought this dress for a formal night on my upcoming cruse. It fits perfectly and is true to size. luxury at a good price.